This series of articles is about true incidents in the history of Yucatán. The focus is on extraordinary history — events unexpected, surprising, far from the ordinary, perhaps not well known. The Yucatec Mayan language has two words that correspond to English “Wow!” — “¡Maare!” (a good “wow”) and “¡Uay!” (a bad “wow”). May the reader experience both. These stories are about the YucatánPeninsula, which includes the modern Mexican states of Campeche, Quintana Roo, and (confusingly) Yucatán, plus a slice of northern Belize and Guatemala. Each article includes suggestions about places modern explorers can visit that are connected with the events. Spelling of Mayan personal and place names can be a source of some confusion. The Academia de Lengua Maya de Yucatán (ALMY) introduced a system of standardized and accurate spelling in 1984. However, these articles mostly use the older and more familiar Spanish-style spellings. For example, we use Yucatán (not Yúukataan) and Ahau Canek (not Ajaw Kan Ek’). 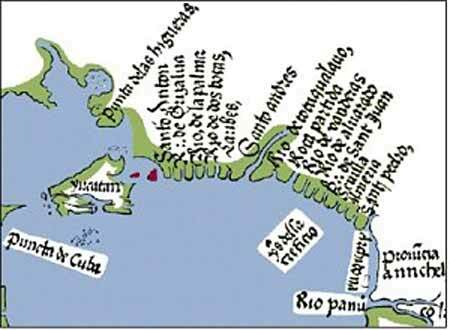 None of the invaders from the Old World knew what lay west of Cuba between Honduras and Florida, even though Europeans had actually sighted Yucatán. In 1508, Vicente Yáñez Pinzón and Juan Díaz de Solís, sailing north from Honduras, where Columbus had landed six years earlier, were searching for the expected passage through to the Southern Sea and the Spice Islands of Asia. They coasted the peninsula, failed to identify a strait, and their discoveries received little notice. The governor of Cuba obtained a royal license for an expedition of discovery, motivated chiefly by the need to find new sources of Indian slaves to work the farms and mines of the Greater Antilles. Three ships commanded by Francisco Hernández de Córdoba set out in 1517, and after six days’ sailing, they sighted a flat island — Isla Mujeres — and went on to what they perceived to be a larger island nearby. Here they made the first contact with Maya people. The Castilians were well received, gifts were exchanged, and Hernández claimed the land for seventeen-year-old King Carlos I and his co-regent mother, Juana the Mad. Hernández had arrived in the Maya chiefdom of Ecab. The people said “Ecab catoch,” meaning “We are from Ecab” in their language. The Spanish heard it as “Cabo Catoche,” and the cape at the northeastern tip of the peninsula still bears that name. They also recorded the name “Yucatán” for the first time. Many theories on the word’s origin exist. Among the more credible reported versions are Ma’anatik ka t’an (“I do not understand you”) and Uh yu ka t’an (“Hear how they talk,” an expression of astonishment). The Castilians christened the “island” Santa María de los Remedios, although the name seems to have died quickly. It was natural enough for the Spanish to believe the YucatánPeninsula to be an island. All the places they had discovered and settled in the quarter-century since Columbus returned from the Indies were islands — Hispaniola, Cuba, Puerto Rico, Jamaica, and many smaller ones. Juan Ponce de León had made a disappointing visit to Florida in 1513, and he assumed that peninsula to be another island. Columbus had been on the coast of Central America during his fourth voyage, and Vasco Núñez de Balboa had crossed the Isthmus of Panama and seen the great Southern Sea, but neither had any idea they were on the mainland of a vast continent. The prevailing idea was that those lands were islands off the coast of Asia. After adventuring inland and surviving an attack — the first gunshots and first European battle fatalities in Yucatán — Hernández and his cohort sailed on around the peninsula and along its west coast, where they visited Maya towns at the present sites of Campeche and Champotón. They found the large populations and well-made stone buildings impressive, but the locals attacked and decisively defeated them. The survivors straggled back to Cuba, where Hernández died of his wounds. Their discoveries caused great excitement. Here was a high civilization, with structures, clothing, and agriculture much more advanced than anywhere in the Caribbean, and the few gold trinkets they had collected were even more inspiring. The Hernández expedition was essentially a failure, but its importance was clear to all, and a second, larger expedition to the new-found western “island” quickly followed. The governor, Diego Velázquez de Cuéllar, appointed his nephew, Juan de Grijalva, to lead the effort and sent him off with four ships in January 1518. This time, one of the ships carried a cannon. The party landed on Cozumel. They were treated well by the inhabitants and were amazed by the fine clothing and large stone buildings. The island’s name comes from Cusamil Petén, or SwallowIsland, although the Spanish named it Santa Cruz. Grijalva apparently also suggested the name Isla Rica (RichIsland) for Yucatán, although that too failed to catch on. On Sunday, May 9, 1518, Grijalva’s party, exploring along the coast south from CozumelIsland, sighted a fishing village at the entrance to “una entrada ancha,” a wide inlet, which they named Bahía de la Ascención, in recognition of the Feast of the Ascension, which they had celebrated on the preceding Thursday. The water was too shallow for his ships to pass safely, and provisions were running low, so they left the inlet and returned to Cozumel. Grijalva and his very experienced pilot, Antonio de Alaminos, were convinced this could be the expected strait connecting the Caribbean with the Southern Sea, which is to say the Pacific Ocean. In any event, it clearly was the channel that bounded the southern edge of the Island of Yucatán. After resupplying with their new friends on Cozumel, Grijalva followed the Hernández route around to Champotón, where the locals again forcefully invited them to go away. Another battle ensued. The cannon produced better results for the Spanish this time, and most escaped with their lives. Farther south, they found the wide entrance to the Laguna de Términos, obviously the terminus of the passage connecting back to AscensionBay on the east coast and providing further confirmation that Isla Rica was indeed an island. Further adventures — and battles — followed as the invaders traveled to the coasts of present Tabasco and Veracruz. They made friends with the Totonacs, who wanted help against their Mexica overlords. They glimpsed great mountains inland and at last realized they were on the edge of a continent. They returned to Cuba full of enthusiasm and with news that a powerful and wealthy empire existed beyond the mountains in central Mexico. Governor Velázquez, as excited as anyone, exercised his official duty and named Grijalva’s “island” Carolina in honor of the new King Carlos. This name also failed to take hold, although the English recycled it a century and a half later to honor their own King Charles. Bringing this era of history to its conclusion, the next year, Hernán Cortés followed Grijalva’s route along the western coasts with eleven ships, 530 European fighting men, some armed with crossbows and arquebuses, about fifty sailors, at least seven women, two priests, several hundred Cuban Indians and a few Africans, fourteen artillery pieces, sixteen horses, and numerous fighting mastiffs. Two years later, Old Mexico and the Aztec Empire vanished. Ironically, Yucatán’s isolation from the rest of Mexico did give it many characteristics of an island well into the twentieth century, with effects continuing even today. Bahía de la Ascención (Ascension Bay) is now part of Mexico’s vast Sian Ka’an Biosphere Reserve, a UNESCO World Heritage Site. The shores of the bay itself can be reached by two difficult roads, one south from Tulum to Punta Allen (doubtless the site where Grijalva saw Maya fishermen at work, still a fishing village), the other off the main Highway 307 to Vigia Chica. Boat trips and other ecotours may be arranged at several locations and provide valuable employment for local people. The entrance to the Laguna de Términos, the other end of the fictional channel separating Yucatán Island from the mainland, today is dominated by the oil-boom town of Ciudad del Carmen. The Zacatal Bridge crosses the main inlet to the Laguna, with a length of 12,500 feet the longest in Latin America at the time of its construction. It is a main land connection between the “island” of northern Yucatán and the rest of the country. The Laguna is virtually an inland sea, a brackish tidal lagoon 50 miles long and 20 miles wide, mostly bounded by marshes and mangroves. Ecotourism is not highly developed, although some of the shores are protected natural areas, and 279 bird species have been recorded in the region. The potential seems great if damage from petroleum exploration and production can be avoided.